Title : No More Monsters for Me! How often do we let little monsters into our lives: small, cute creatures that seem harmless at first, but grow into ugly, dangerous beasts as we feed and shelter them? We're so charmed by the tiny pet initially that we don't see any harm in adopting it, but we fail to foresee how big and unmanageable it will become as we nourish it. The careless decision to bite off more than we can chew has potential to cultivate a man-eating monster under our own roof, a nightmare we'll have a terrible time getting rid of, if we ever can. Young Minneapolis Simpkin falls into just such a trap in No More Monsters for Me! after a heated argument with her mother in which Minn is forbidden to bring home a pet, "Not even a tadpole"! Furious at her mother, Minn runs out into the deepening twilight and discovers a miniature green monster sobbing in the bushes. The creature looks so sad and alone, and it's starting to rain. Minn doesn't care what her mother says, she's bringing this monster home to be her pet.But the baby beast isn't content to wait quietly in Minn's bedroom while she eats supper with her mother. Minn has to do some quick maneuvering to keep her freakish pet out of her mother's sight, eventually stashing it in the basement with a basket of apples to snack on. Running back and forth between the dinner table and her secret responsibility in the basement, Minn is run ragged by her monster pet. This isn't what she thought she was signing on for when she accepted it into her home. Worse, the creature grows rapidly from the apples Minn fed it. It's a lumpy, unattractive big beast now, bearing little resemblance to the cute monster Minn had mercy on as it wept in the bushes. What is she going to do?Minn's mother surmises that her daughter has smuggled an animal into the house, but she's taken aback when Minn bursts into tears and admits it's a monster. Softening her hard stance against pets, Minn's mother offers a deal: if Minn gets rid of the "monster", she'll allow her a pet. Evicting the gluttonous hellion from the basement isn't easy, but Minn does the job. She's ready for a real pet now, not a monster that's going to take over her life. And her mother is ready, too. Author Peggy Parish skillfully conducts this story with warm humor and gentle philosophy, exactly how an easy reader should be. We can learn from the themes of No More Monsters for Me! our entire lives because the book is written simply enough for preschoolers yet has substance to keep much older kids thinking. Marc Simont's illustrations are also key to the narrative, relating parts of the story not directly addressed in the text. I'd give No More Monsters for Me! two and a half stars. It's not as famous as the author's Amelia Bedelia series of easy readers, but it's a quality read I urge book lovers to set aside time and enjoy. My kids thought this was cute and while the premise was interesting and the overall story funny, the part that didn't jive with us was all the yelling. The mother and daughter interact pretty much only with raised voices. In my home we really try not to yell, so this was a good example of how not to treat each other. Also, the mother doesn't listen to her daughter very well, nor does the daughter listen to the mother. Their communication needs a lot of help and it doesn't really improve by the end of the book. It's funny to read at a playful time, since any communication is yelled and that's always fun, and it was good to discuss reasons that made us feel uncomfortable, so it does have it's good points. It's a classic, moral at the end of the story book. Overall, quite disappointing. I have such fond memories of this book...I have not read it since I was knee high to a grasshopper, but I do remember when the monster was hidden by the young girl in the cellar and he ate all of the pickles...When she had to let him go (sniff sniff) it was always a tear jerker...I also believe that her name was Minneapolis Simskin...How cool is that? One of the children in my class picked this book to read on her own! It's a transitional book that offers some familiarity and a few challenging words as well. My favorite book to read to my daughter. "No More Monsters for Me! By Peggy Parish." I remember adding the author's name on the end, just like that, over the 50 or so times I read it to her. What the heck was the girl's name? Minnesota Simpkin or something? Is that the same book? Have to look it up. Minneapolis Simpkin... that's what it was. This was twice as long as as any other level 1 reader I've ever picked up, contained some difficult language (including names), and was about a mom and daughter who yelled at each other and neither listened to each other. Not a fan of this book at all! As a child I LOVED this book. It was at my grandmother's house and I would read it every time we visited, and often ask to take it home. I've probably read No More Monsters for Me! more times than I can remember. When it was first published, 1981, I was the target audience for this book and I know my school had many of the "I Can Read Books" as text books.Thematically the book is similar to The Little Baby Snoogle-Fleejer by Jimmy and Amy Carter except funnier and a bit more on point. It's a story about consequences and responsibility.Minneapolis Simpkin learns first hand why her mother warns her about staying away from the forest where the monsters live. She thinks her mother is joking (and perhaps she is) until she finds a baby monster in the rain. Clearly the creature needs help but her mother has told her not to mess with monsters. Minneapolis decides to break the rule because it was only a baby.Here's where the book plays up the consequences of rule breaking (and more important secret keeping) to hilarious results. Monsters, and hungry ones especially, grow fast and it gets harder and harder to hide he once baby monster.Ultimately Minneapolis has to confess to her mother and face the consequences of breaking two rules. The final lesson comes with the mother's reaction: frustration and understanding. The monster gets to go home and Minneapolis learns that she was right in helping the baby monster but wrong in keeping it a secret from her mother. Every child wants a pet. Whether its a simple hamster, a rowdy dog, or a crazy cat. And normally parents say no. Well, in this book, Minn Simpkin asks for a pet and mom says no and she ends up bringing a monster home that she finds in the forest. She tries to keep it a secret, and when she decides to tell her mom, her mom doesnt believe her and just thinks she is making it up. Mother gives in and tell Minn she can get a pet. Although pet monsters are not real, I feel like students can definitely relate to this. I found it highly entertaining and fun for all ages. My Thoughts: Level 2-3 readerVery entertainingCreativeWhy were the mom and daughter yelling at each other?? ?I read this book as a read aloud to my kids. They were glued to the pages; they did not move, which is always interesting to see. I secured this title from my local library. There's something special about a story where the main character's name is Minneapolis Simpkin! Minneapolis or Minn wants a pet, but Mom says no. She finds a baby monster and brings it home. What should it eat? Where should she hide it? Can she keep it hidden from Mom? Is having a monster better than a pet? A little girl wants a pet so bad she takes home a baby monster. This turns out to be a bad idea. Through out the story there is just the girl and her mom and no mention in the pictures or the words of anyone else. More of an early reader than a picture book. Not as scary as it sounds. My kids love to hear this over and over. And the illustrations are great! Since it's an easy reader (2nd grade?) it's not too descriptive, so the pictures give the text added meaning. A delightful little story about wanting a pet and instead getting a monster. The illustrations are a little old-fashioned, but the story is still fun and kids will find it humorous as the monster grows at break-neck speed.2nd grade and up will be able to read and enjoy this story. Though this book is easy to read, It started without a beginning. The reader starts off in the middle of an argument without knowing, at first, what the argument is about. It does become clear in the story eventually. I was not happy with the beginning. This is a decent book for young readers, but it's fairly long, so it might be too long to read at one sitting. The narrative isn't too difficult, though, with simple sentences and basic vocabulary. The illustrations are dark watercolors, but are silly and fun and go well with the story. 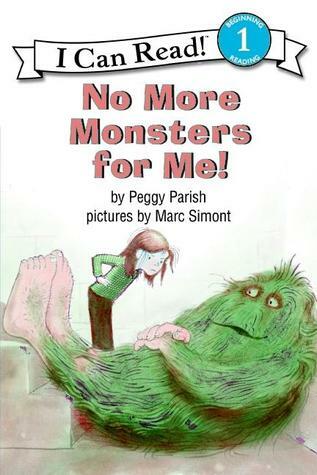 this was like my all-time favorite mmonster story when i was little....it's awsum!!! Hits all the right notes about parenting, negotiating, and taking responsibility for your actions. My Dad is allergic to all sorts of animals, so I can totally relate to Minn's quest for a pet. My favorite part of this book is how Minn and Mom are constantly yelling at each other. Ha ha! So many early readers are kind of boring, but this one had her excited to turn each page and keep going to the end. Eh. Not a big fan of kids + monsters stories. It was okay, better than some I've read. TimetriaI do not want a monster for a pet. they eat too many apples. My daughter brought this home from school to read to me and I feel in love with it. This was one of my favorite books as a kid. I just loved it. And I still do...and read it to my little ones. Jane adored this book and had me read it over and over. I didn't think it was that amazing, I just think she really likes books about monsters. This was one of my favorite books as a kid. I like the baby monster illustrations, and how the monster's stomach gets all lumpy after eating all the apples.